There is an ancient archaeological shell midden – the refuse from what was once, at least, a seasonal camp on Raymur Point at the intersection of St. Laurence Street and Kingston Avenue. 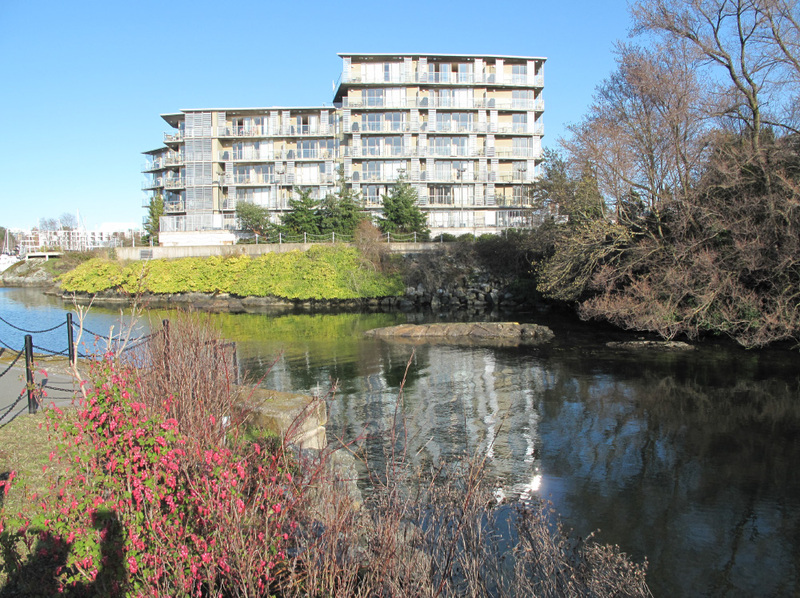 Raymur Point is a raised bedrock peninsula on the south side of Victoria’s inner harbour located to the west of Laurel Point and at the east end of Fisherman’s Wharf. The site was not occupied by First Nations in historic times and appears to have had a limited occupation in the distant past. Figure 1. 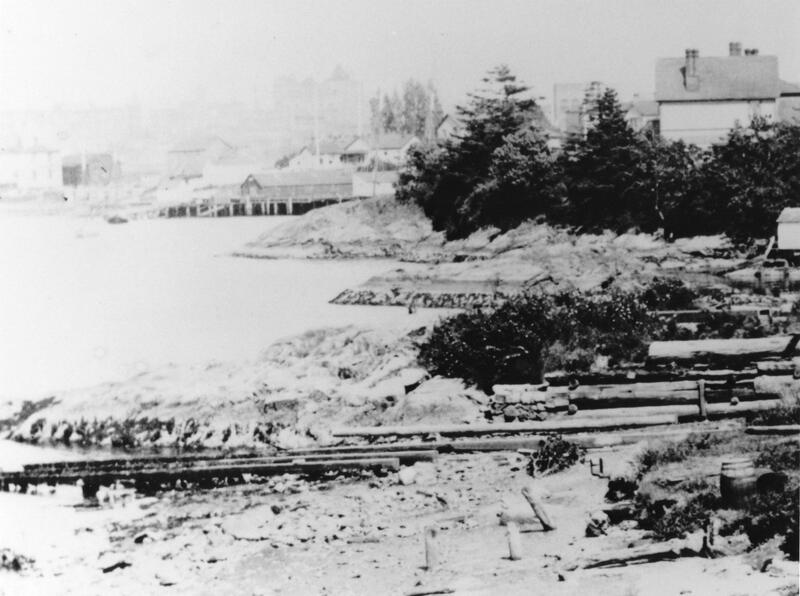 Western portion of Victoria’s Inner Harbour in 1878. Shoal Point in the foreground is the start of the inner harbour. Raymur Point can be seen as a small peninsula with a house on it at the centre of the right side of this lithograph. 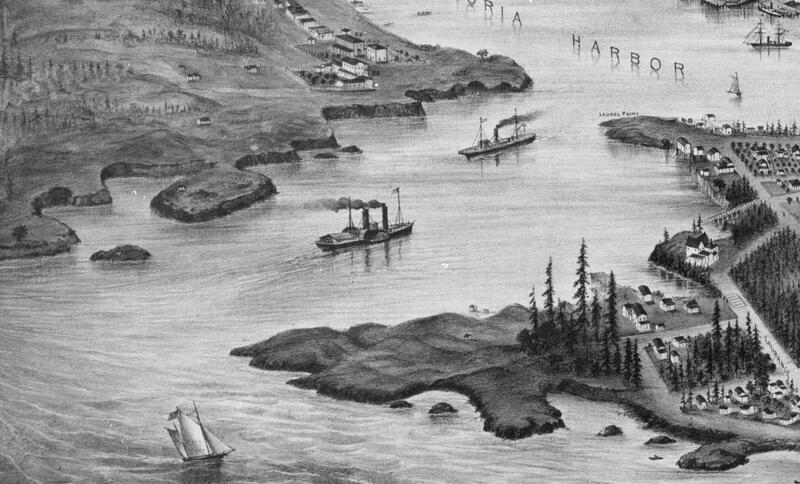 Close up of Bird’s Eye View of Victoria, 1878. RBCM PDP-02625 . The midden location, known as Archaeological site DcRu-33, includes the extreme northern extension of the point and the shoreline along the wider section of the point extending along the west shore to the area around lots 1291 and 1292 on the west side of St. Lawrence Street. 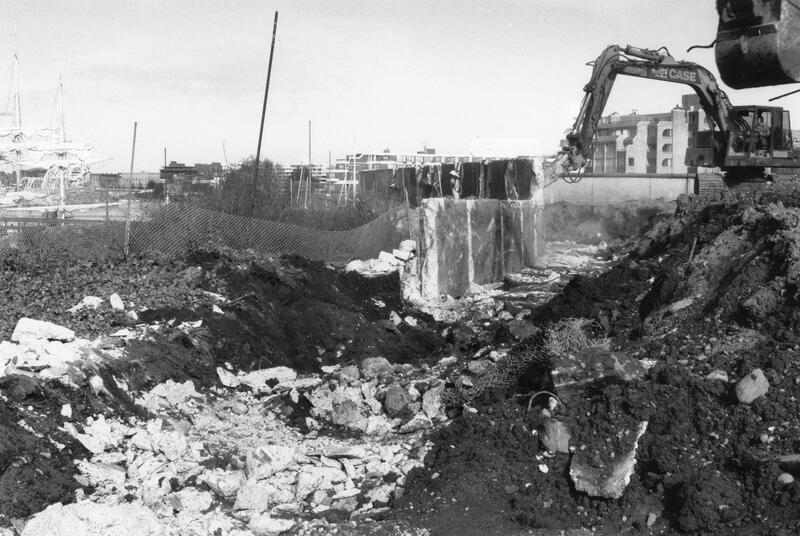 The site is now mostly destroyed by the building and clearance of the large Texaco Oil storage tanks that were here until the 1980s (see figure 10), and the more recent building of apartment units. Midden may still be intact on some parts of the adjoining lots 1291 and 1292. The latter locations were not included in the last Archaeological work undertaken on the site in 1998 (Hewer 1998). The original configuration of the peninsula can be seen in Figure 2. The large home just to the right of the centre of this photograph is still on lot 1291 near the corner of St. Lawrence and Kingston Street’s. Figure 2. Raymur Point in the late 1890s. Richard Maynard Photograph. BCA A-3457. An 1890s, close up of the northern tip of the Point can be seen in Figure 3. This shows the area of the (then) probably undisturbed midden. The midden eroding over the bank can be seen in Figure 4. 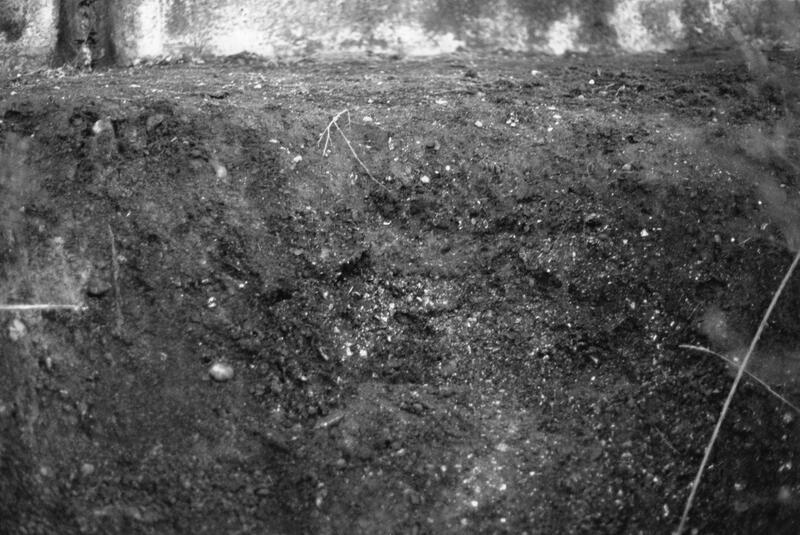 I took photographs in March 1990, during the digging out of the foundations left over from the removed of oil tanks. Figure 3. North end of Raymur Point at centre. The house on the right is located beyond the next small bay and not on Raymur Point. Close-up of RBCM F-9653. Figure 4. Midden eroding out of a crevice. The house on lot 1291 can be seen in figure 5. 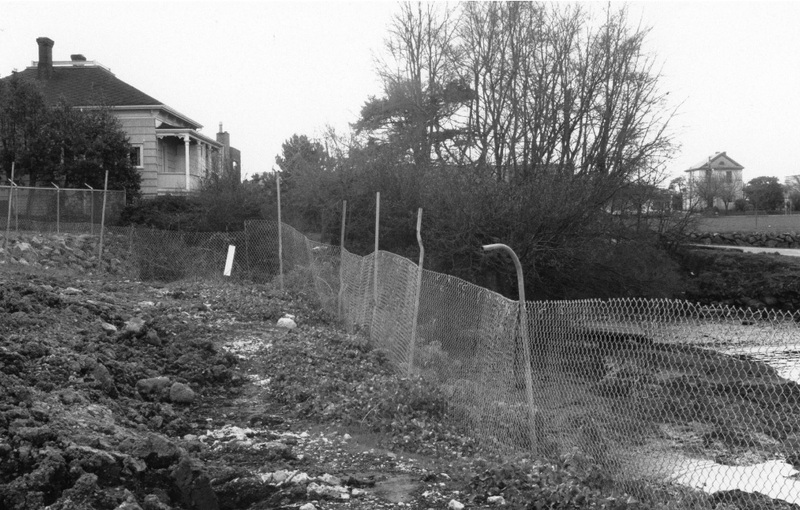 This photograph shows the west side of the site where only disturbed midden and extensive rock fill existed in the foreground in 1990. Figure 6, shows the north end of the site where midden can be seen slumping down the bank into a tiny embayment in the bed rock. It is below this area where I collected some of the artifacts. Figure 5. The west side of the site in 1990, showing disturbed shell midden. Grant Keddie photograph. The east side of the site is seen in Figure 7. This area was previously destroyed and now being dug up again. The northern tip of Raymur Point is on the other side of the bulldozer in the photo. 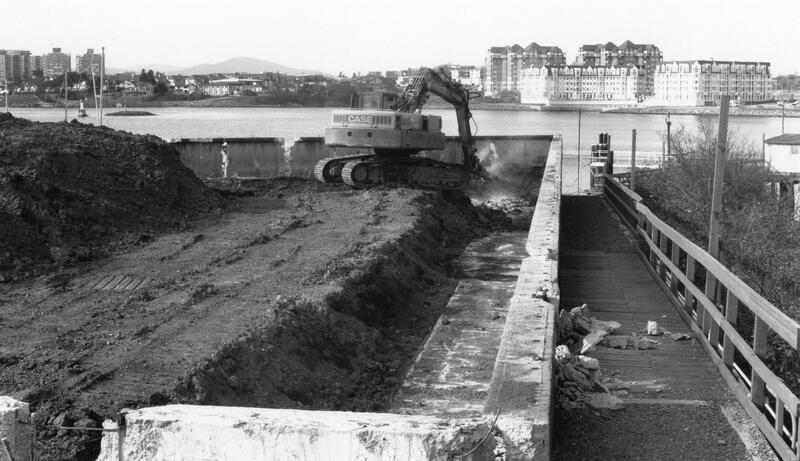 The now destroyed Lime Bay First Nations defensive site, DcRu-123, can be seen across the harbour in the form of the knoll just to the right of the backhoe. Figure 6. 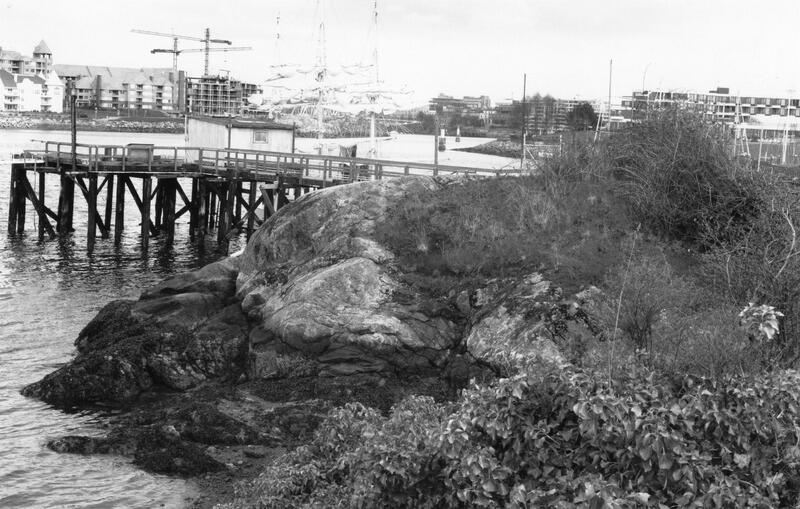 The north end of Raymur Point in 1990, before the condominium development. Midden can be seen eroding down the face of the bedrock. Grant Keddie photograph. Figure 7. Looking North on East side of Raymur Point. Figure 8. Looking east at the black midden on the outside of the cement wall. Figure 9. The same bedrock area seen in Figure 6, after 25 years of erosion. Grant Keddie photograph, 2015. Figure 10. Raymur Point covered with oil storage tanks. 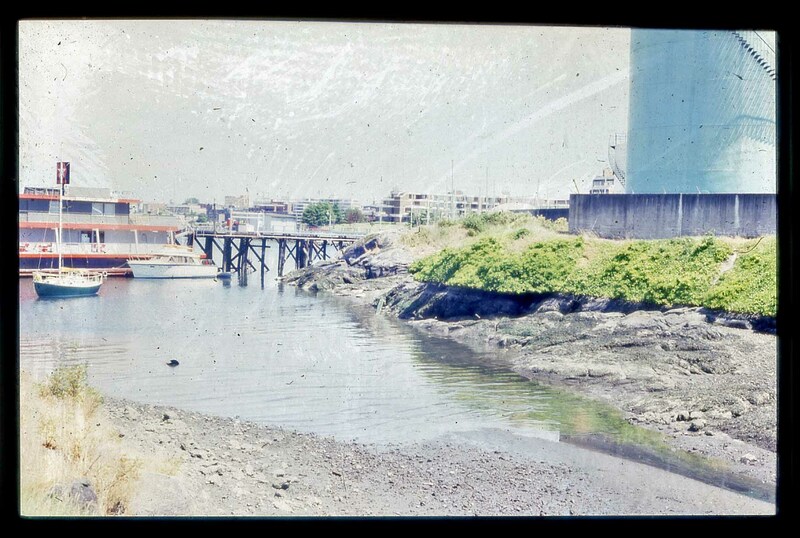 Keddie photograph 1986. Figure 11. Raymur Point on right with dock on north end. Keddie photograph July 29, 1993. Figure 12. Raymur Point as it looked on March 29, 2012. Looking east from the Fisherman’s Wharf Area. On May 8, 1986, I observed that the shell midden was composed of mostly native little neck and butter clams, and some cockle clams and barnacles. This is not the unusual kind of mollusks found in other ancient sites in Victoria’s inner harbour and those further up the Gorge Waterway. The latter contain mostly native oyster shells. The site contained many fire-altered rocks, scattered throughout the midden. These were traditionally used for steaming or boiling food. 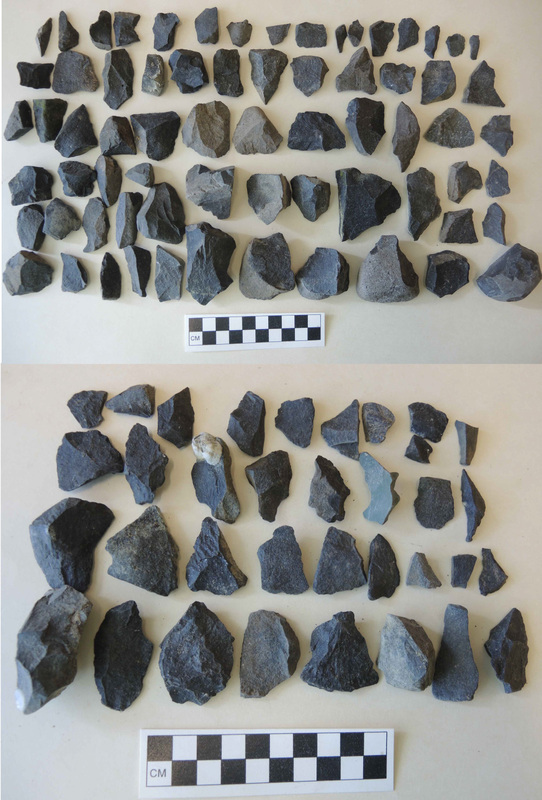 Most artifacts found in the site were stone waste materials, such as cores and flakes, resulting from the making of stone tools. These, the other limited artifact contents of the site, and the shallowness of the cultural deposits indicate that the location was occupied for a limited time, at least on a seasonal basis, around 2000 years ago. A single human burial was recovered from the site in 1956, when constructing a cement wall. These remains were subsequently re-buried in the cemetery on the Songhees reserve. I located and talked to the bulldozer operator who worked on the site in 1956. He told me that the burial was in a flexed or fetal position. 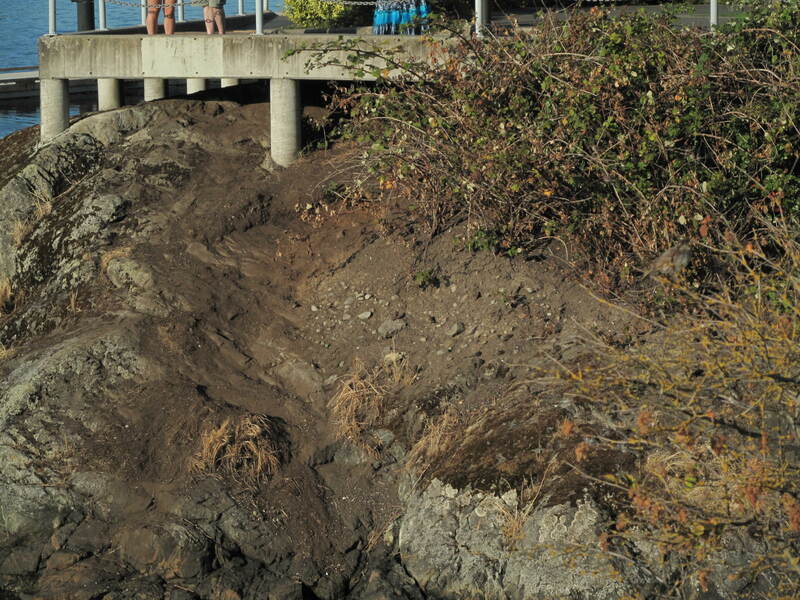 He observed that most of the midden was concentrated toward the east of Raymurs Point, where midden can still be seen eroding down the bank today. On May 7, 1991, I examined the excavation trench for a waterline installation around the north side of the centre line on Kingston and St. Lawrence. There was no midden under St. Lawrence Street in front of 1293, 1292 and 1291 lots or under the Kingston Street and St. Lawrence intersection. Artifacts were sporadically collected from the surface of this site from 1956 until 1998, when the first formal site evaluation was undertaken that involved the excavation of test pits. Museum employee Micheal Kew recovered bone artifacts DcRu-33:1-2 in 1956. #1 is a portion of a ground bone that is broken at both ends. It was likely a fish hook barb; #2 is a mid-section of a deer femur with ends that were sectioned through but have extensively weathered, making it difficult to see if it might have been cut with an iron hacksaw. Butcher shops in 19th century Victoria often sold deer and elk meat. 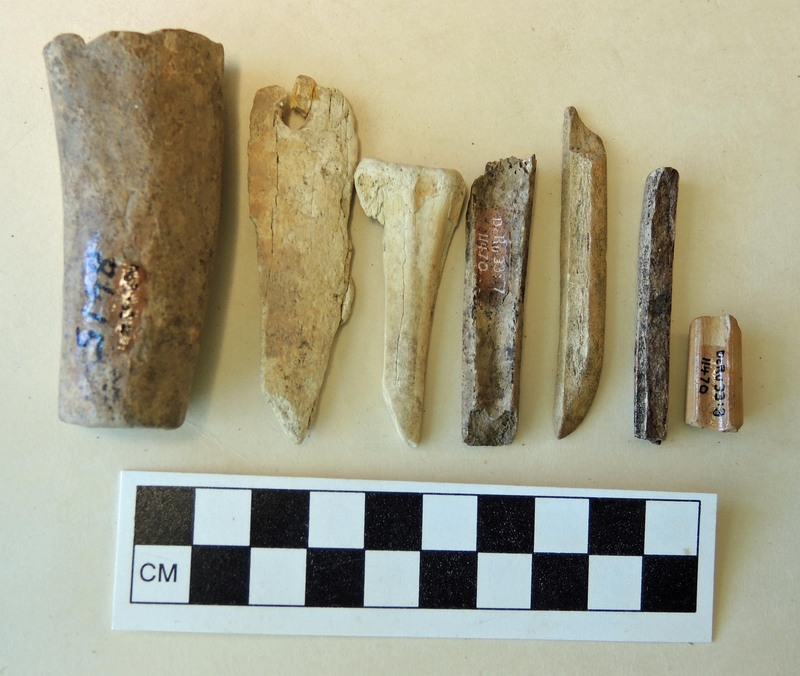 The way this bone is cut is similar to others found in historic garbage dumps, and not like those found in ancient aboriginal sites (Figure 12). Don Abbott and John Sendey of the (then) Provincial Museum, surface collected artifacts DcRu-33:3-17. These included #3, a sawn section of a deer femur bone; #4 is a unique side indented projectile point, likely for use as a point on a spear as it is too large for an arrow point. It is a flaked basalt point that is heavily ground on both sides from the notched area near the bottom to near the top or distal end (Figure 11). 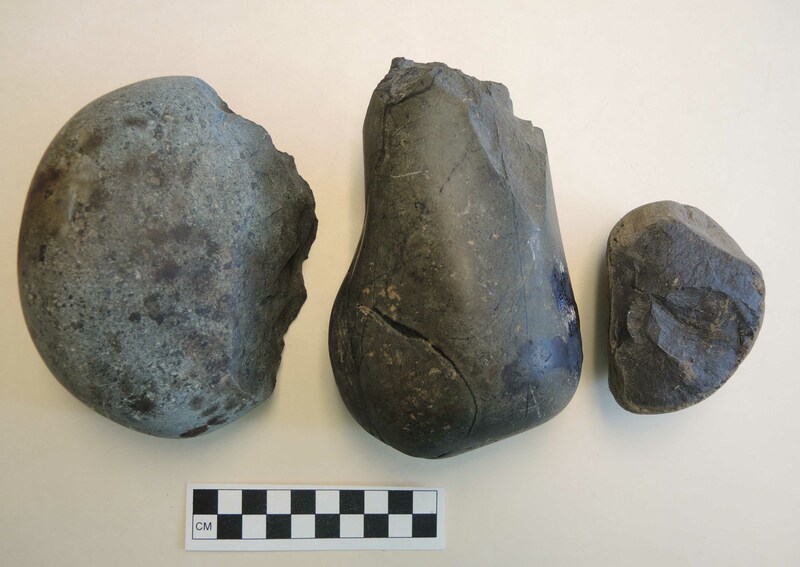 #5 is a fragment of a burnt sandstone abrader; #6 is a naturally fractured basalt cobble, but is of stone tool making quality and may have been brought to the site location; #7 is a small section of a mammal bone with grinding of one edge. Figure 11. Projectile points. Left to right. DcRu-33:4. Corner indented point. Possibly for small spear. DcRu-33:21. Unfinished projectile point that was broken during manufacture. 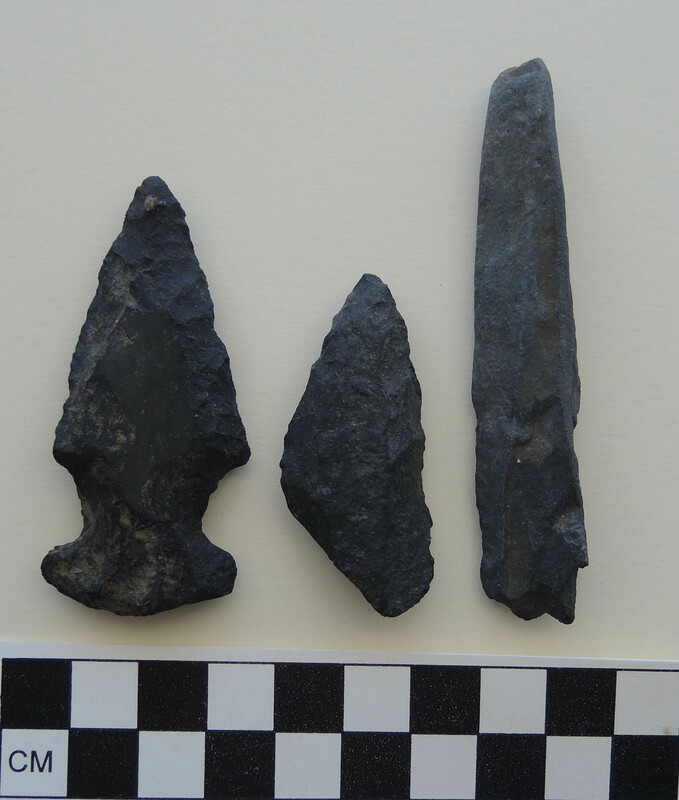 DcRu-33: Small portion of what was once a large hexagonal slate spear point. Figure 12. DcRu-33:3. Sawn and ground section of mammal bone. DcRu-33:20. Fragment of ground bone tool with drilled hole. DcRu-33:19. A non-artifact. Unworked deer cannon bone.DcRu-33:7. Section of a mammal bone with grinding of one edge. DcRu-33:9. Portion of a split deer cannon bone, ground on one end. DcRu-33:1. Portion of a bone fish hook barb. Figure 13. DcRu-33:16. Two sides of a large block sandstone abrader. #8 and #18 are very small siltstone beads. 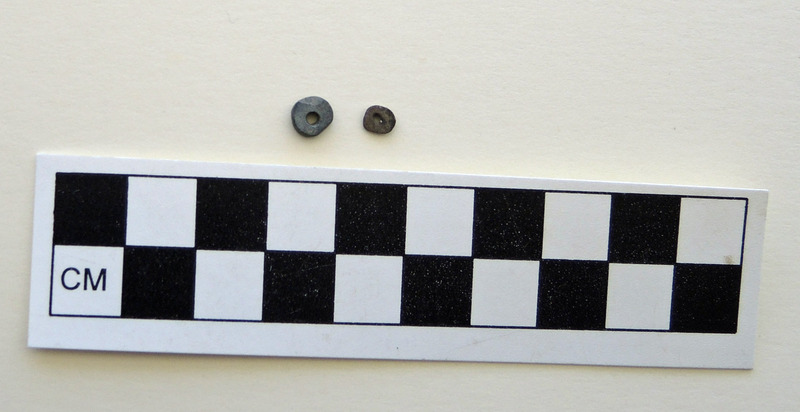 These types of beads are only found in sites pre-dating 1800 years in this area; #9 is a portion of a split cannon or lower leg bone of a deer which is ground on one end; #10 is a broken portion of what was once a large thick hexagonal slate point. This type of point, like the stone beads, is not found in sites dating in the last 1700 years in this area; #11 is an extremely fine flat bar shaped abrading stone ground on both surfaces; #12 is a thicker rectangular sandstone abrader ground on two sides. #13 and #17 are large fractured beach cobbles from the disturbed surface of the midden. It is possible that they are both rocks smashed by heavy machinery working at the site during the time that the large Texico oil tanks were installed on the property. This is a common pattern I have observed in urban areas around construction sites. The edge damage does not suggest that they were used as cobble choppers and the flake patterns are inconsistent with intentional human flaking patterns for this type of raw material. 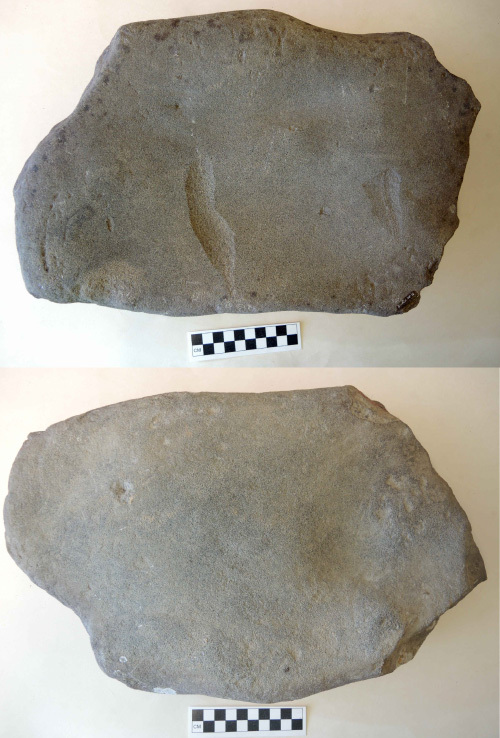 The type of stone is not the same as that found in the flakes at the site, which suggests they are not cores from which intentional flakes were removed (Figure 16). Figure 14. Bottom row L. to R.: DcRu-33:12. Rectangular sandstone abrader. DcRu-33:5. Triangular portion of a course grained abrading stone. DcRu-33:11. Smooth, shaped slate abrader. Top: DcRu-33:15. Fragment of shaped sandstone abrader. DcRu-33:14. Stone flake. On December 4, 1986, I found artifact #s 19 to 21 in disturbed midden on the surface at the north end of the site. #19 is an unworked deer cannon bone; #20 is a fragment of a mammal bone tool. It is a broken flat piece of bone with a bi-conically drilled hole near its intact end. This is possibly a netting needle fragment; #21 is a portion of a bifacial tool that was started, but broken during manufacture and not finished. On May 8, 1986, I found 103 stone flakes eroding out of the midden and fallen on the beach at the edge at the north end of the site. 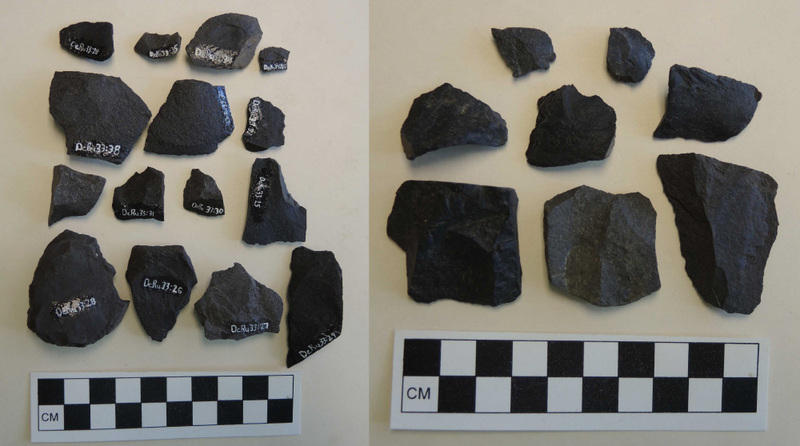 #22 includes a group of 35 stone flakes with no original outer cortex – indicating they are secondary flakes struck after the outer cortex of the original stone was removed; # 23 includes 68 stone flakes with remnants of the original outer cortex of the rock. Another eight flakes I collected from disturbed surface midden on February 15, 1991, included 6 with portions of the cortex and two without. 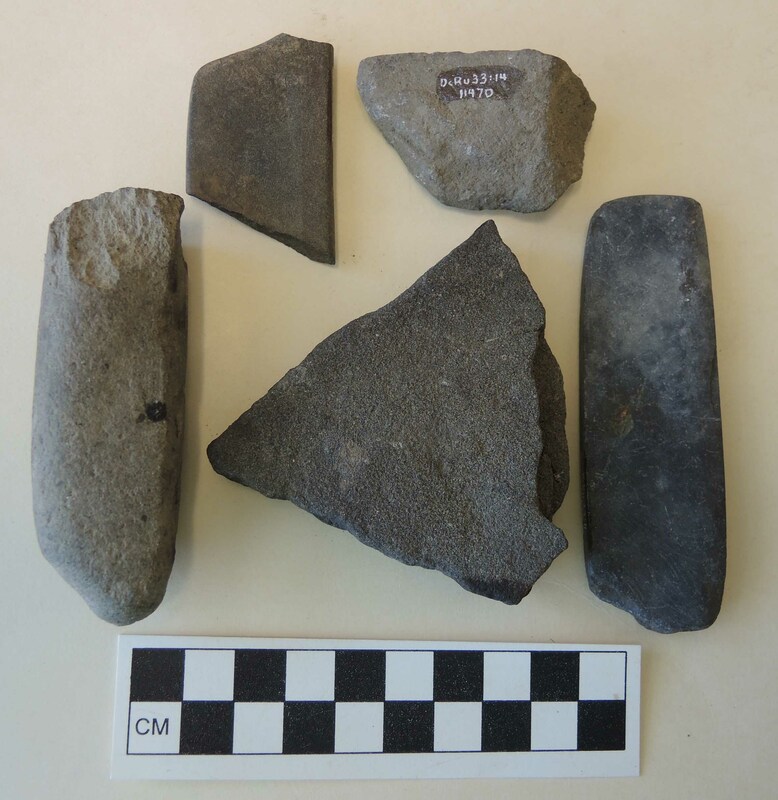 This assemblage indicates a practice that likely involved collecting local cobbles and flaking them in the process of tool making on the site. Figure 15. Small flat siltstone beads. DcRu-33:8(6mm diameter). DcRu-33:18 (5mm diameter). I. R. Wilson Consultants Ltd., working under permit in 1998, recovered 23 stone flakes in excavation test pits and in disturbed midden areas. #24a included 8 stone flakes and #24b to # 38, another 25 stone flakes. None of the flakes from this site show any signs of intentional secondary flaking or unintentional use wear. Some slight breakage on a few very thin edges is not a produce of tool use but of tool manufacture. Figure 16. DcRu-33:17 and DcRu-33:13, are large fractured stone cobbles. DcRu-33:6. A naturally fractured basalt cobble. Figure 17. Top: DcRu-33:23. 68 stone flakes with portion of the original outer cortex of a stone cobble. Bottom: DcRu-33:22. 35 secondary flakes. Figure 18. Left: DcRu-33:24b-38. Stone flakes collected by I.R. Wilson excavations in 1998. Right: DcRu-24a. 8 stone flakes collected by author in 1991. Hewer, Tony. 1998. Archaeological Inventory and Site Evaluation 129 Kingston Street, DcRu-33, Victoria British Columbia. Heritage Conservation Act Permit 1998-050.I.R. Wilson Consultants Ltd. Prepared by Tony Hewer.